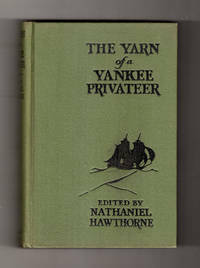 The Yarn of a Yankee Privateer. 1926 First Edition, BAL 7649. Rare Dustjacket. NY: Funk & Wagnalls, 1926. Clean in sound binding. VG+, no dust jacket. . Few tiny, faint dots of foxing on title page.. First Edition First Printing. Hard Cover Cloth. Very Good +/No Dust Jacket. Funk & Wagnalls Company. Collectible - Acceptable. SIGNED BY CLIFFORD SMYTH! NY: Funk & Wagnalls, 1926. 1st. Hardcover. 12mo. 308 pgs. B/w frontis of Hawthorne, b/w plates. Signed by Smyth on front endpaper, no inscription. Near very good with no dust jacket. Green cloth. Covers edgeworn and have light soil. Contents clean and binding sound. Inquire if you need further information. new york : funk and wagnalls, 1926. 1st Edition . Hardcover. Very Good+. Very nice looking copy in green boards with black embossed lettering and sailing ship on front cover. very little wear clean unmarked contents. square corners. New York: Funk & Wagnalls, 1926. Minor wear to edges. Water stain top of pages 93 - 155. Binding tight, pages unmarked. Black & white illustrations.. Reprint.. Hardcover. Very Good/No Jacket. New York: Funk & Wagnall, 1926. First Edition. Hardcover. Very Good. 8vo - over 7¾" - 9¾" Light shelfwear. All 12 plates accounted for.